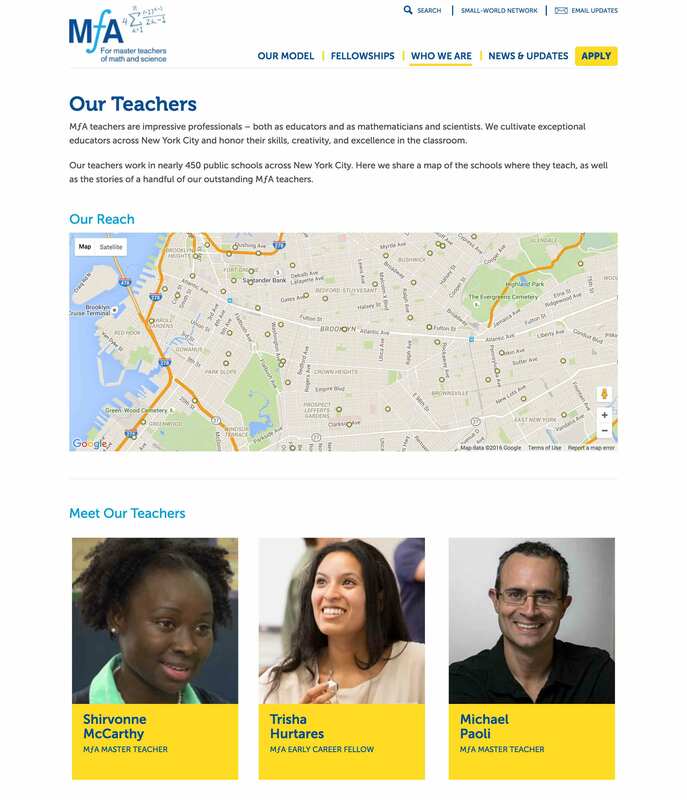 The folks at Math for America are radically overhauling the teacher recruitment process in the areas of math and science, so they called on BFC (in partnership with Brooklyn-based design firm Big Duck) to give them a brand new web interface. Our work gave the MFA team a clean and accessible site that makes it easy for both its users and staff to navigate the demand for teachers in these key fields, with the end product offering a mix of information, testimonials, and application tools for prospective candidates. The homepage is an important first stop on the path to discovering the Math for America mission, so we loaded it with different entry points into the site–including menus, slideshows, images, text, and vital links to useful resources. 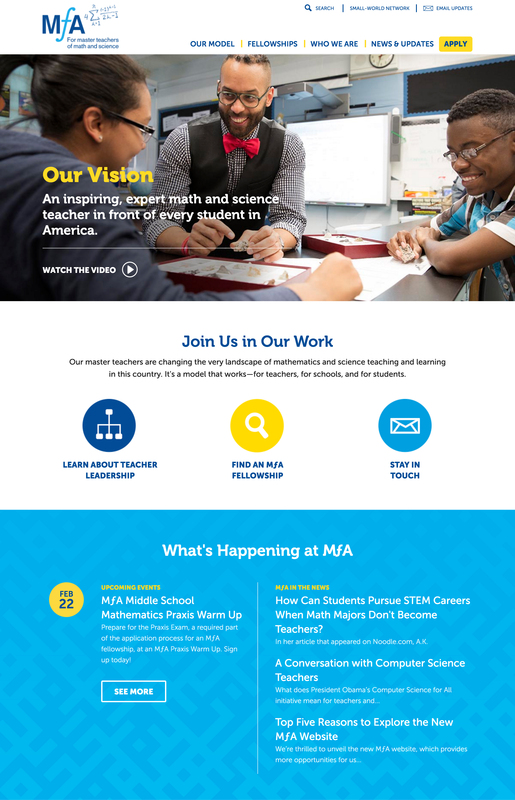 With key events and news always incoming, the homepage highlights the busy calendar of the MFA team, as well as offering a peek around the door at features on the site, including teacher profiles, various development courses, and crucial ways to communicate with the organization. Math for America’s master teachers are changing the very landscape of mathematics and science teaching and learning across the country. It’s a model that works—for teachers, for schools, and for students. The Our Teachers page is a gateway into the minds that make up the wider group of Math for America teachers. We sliced the page into two parts, with an interactive map helping illustrate the sheer breadth of the program’s reach in New York City, and a series of links to students who became fellows of the organization. Clicking through to the profiles offers prospective candidates a chance to see how suited they are to the program, and we laid out a simple list of facts on each graduate as well as a larger biographical section, complete with important links to help kick off the application process.